Rosenbauer has further developed its training system for airport fire services and can now offer a complete, mobile version of the proven PANTHER tactical simulator. This stand-alone solution is housed in a ro-ro container swap body vehicle and merely requires a 400V electricity supply for operation. The container can be moved at any time from one airport to another where the respective crew to be trained is stationed. Consequently, the training system can be operated on an absolutely location-independent and autonomous basis. The new mobile PANTHER simulator has two sections comprised by simulator and instructor rooms, both of which are fitted with powerful air-conditioning units. In the simulator room trainees find an exact replica of the working area in the PANTHER cockpit. The seat, steering wheel and joysticks are all in precisely the same place as in the original and are operated in identical fashion. Moreover, just as during a genuine response, the steering provides feedback regarding the terrain (steering resistance, automatic redirection when emerging from bends, etc.). The view from the cockpit is projected on 55“ ultra-high-definition monitors with two screens forming the front windshield. Two more screens represent the left and right lateral windows with integrated rear view mirrors, while a roof monitor shows the extinguishing arm and the roof monitor. This means that the simulator offers perspectives, which match those in the original vehicle exactly. The PANTHER simulator can be employed for the training of a complete fire service operation from the run across the airfield, to the water/foam attack on a burning aircraft and the related evacuation scenarios. In the standard configuration, training is carried out using a generic, practice airport with two runways. However, on request any airport layout including individual runway traffic can be preprogrammed. As a rule, the extinguishing attack takes place on five of the commonest types of aircraft (including the Airbus A380), as well as a medium-sized helicopter. Apart from escaping kerosene, among other hazards a burning engine, landing gear that has ignited during touchdown, or a fire inside the plane can all be dealt with. The controls of the extinguishing technology are as accurate as those in the original truck. All the physical parameters such as the monitor kinematics and the throw parabolas, etc. are preprogrammed and provide a near-reality extinguishing attack. The combined range of movements of the extinguishing arm with the monitor and the piercing tool covers every attack position. In principle, the instructor can establish any selected scenario and for example also alarm a complete set of vehicles apart from the truck being driven by the trainee. Views of the other vehicles are provided, which enables a combined operation to be practiced. Furthermore, various wind, weather and visibility conditions can be accounted for in the simulation along with various terrains during the response and obstacles on the tarmac. All the data and parameters relating to a simulated drive are recorded, subsequently analyzed by the instructor and discussed with the trainee. The “Flying Eye” function, which shows the exercise from every conceivable angle including a bird’s eye view, can be employed for this debriefing. Moreover, the simulator interface is so simple and easy to operate intuitively that after only brief coaching any fire service instructor can create operational scenarios alone and complete training sessions. 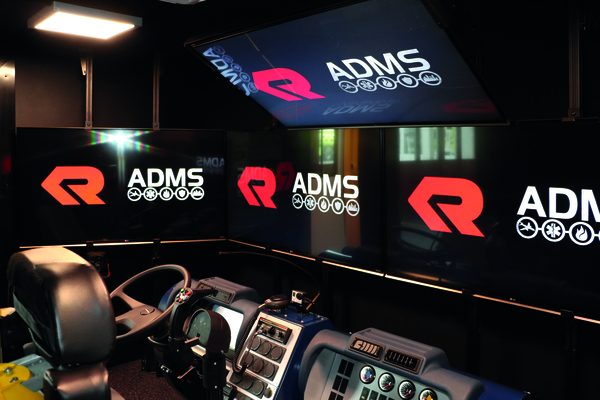 The advantages of simulator training are virtually self-evident. It allows the realistic and safe practice of more or less every operational scenario, including exceptional circumstances. Training can be carried out repeatedly until every move is perfect and the sessions are reproducible, which facilitates detailed follow-up discussions. Furthermore, neither fuel nor extinguishing agents are required, vehicles are not subject to wear and tear, and no environmental impact is caused. 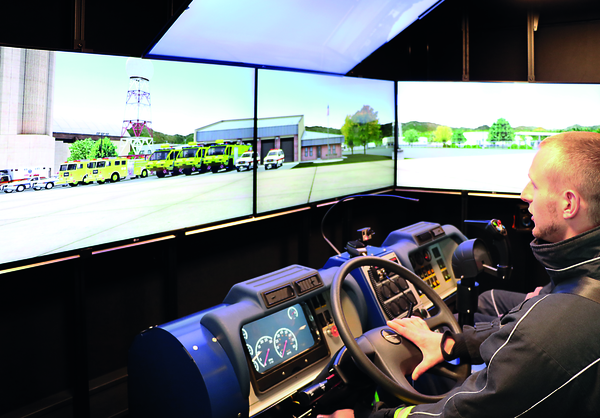 On top of these benefits, the PANTHER simulator offers the advantages of mobility, as fire service personnel no longer need to travel to a training center in order to practice because the simulator simply comes to them. The first customer to employ the mobile PANTHER tactic simulator is the US Army stationed in Germany.